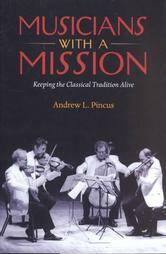 "Andrew L. Pincus is the music critic for the Berkshire Eagle in Pittsfield, Massachusetts, and has been a contributor to the New York Times, Boston Globe, Opera News, Musical America, and numerous other publications. He has twice won the ASCAP-Deems Taylor Award for excellence in music criticism. He lives in Lenox, Massachusetts." - From the flap of Tanglewood: The Clash Between Tradition and Change.